An early morning gong booming, the singing of prayers by my friend, and the crowing of roosters stirred me out of bed. Today’s goal was Kakani, which should have made for a short walk, though I was having trouble reconciling my GPS device with the published Helambu map. On the map, Kakani is a town with full amenities (school, monastery, and a guest house), but it does not even appear on my GPS, nor does the trail for this section. Not worried about getting the Helambu merit badge, I plotted a route to get me generally in the place I needed to be. 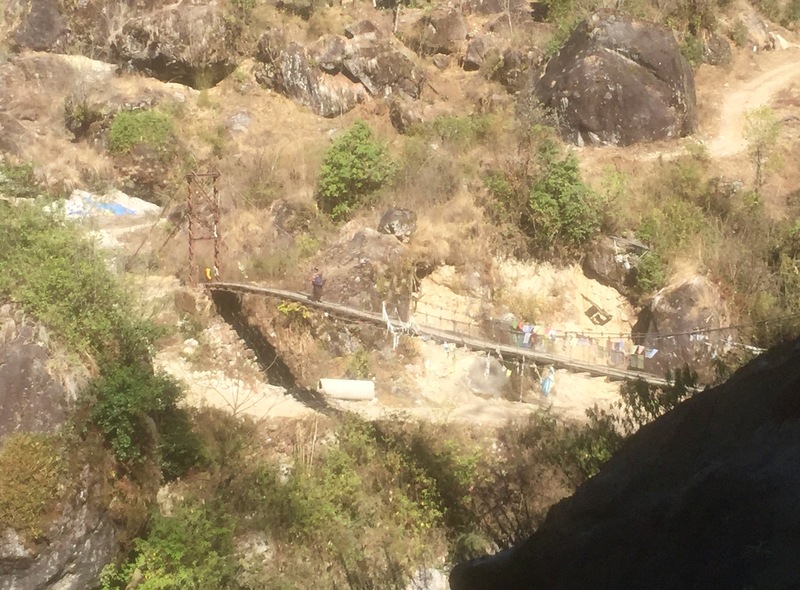 The Helambu track is basically a hike up and down a river valley (the Melamchi River). Starting on the western side, it follows high ridges until Thadepati, then drops down to Melamchigaol which is at the headwaters, so today’s trek would be down the eastern side of the river valley. I lounged in my cot for a while before starting to pack and then was called to breakfast which definitely included “free range” eggs as they were from the yesterday’s rice-eating chicken. Couple that with a pancake covered with honey and two cups of black tea, and I was ready for the day. Not anticipating a long day’s walk, I roamed the village a bit, peering into the wreck of the monastery. 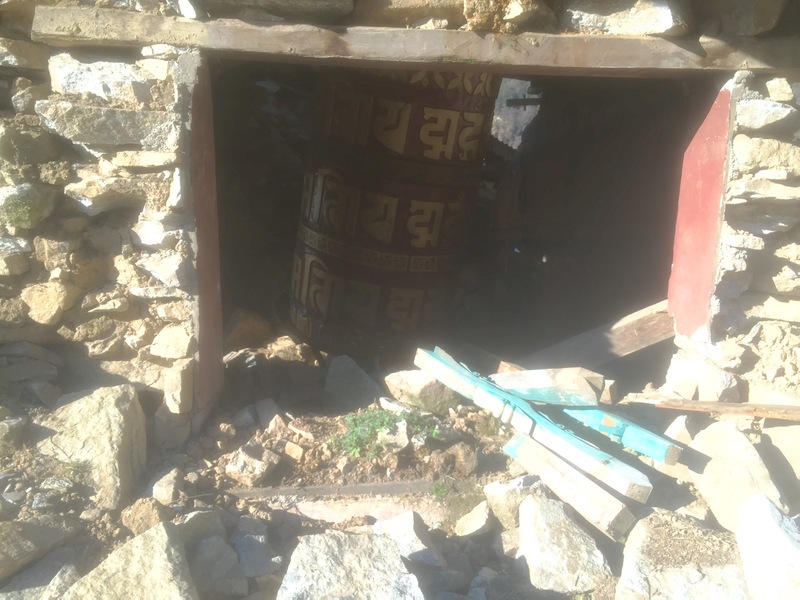 One room not completely destroyed had a huge prayer wheel, still there but tilted and unspinnable. There was a Buddhist monk in robes and some high tech running shoes- such is the modernity of Melanchigaon. After saying warm goodbyes to my hosts, I turned my head south. The descent out of the highlands was not easy. The path was clear, but the way was steep. Just below Tarkeghyang there were two routes south according to my map. I chose the one to the right hoping it would lead to Kakani. It was a well-formed road that was no longer used by vehicles because of rockslides. On the way out I stopped by a stream for water. Many of the people living here will make a small pool in a falling stream, four or five inches deep, and then punch holes in the base of a half-liter plastic soda bottle and attach a hose coupling to the top. Place it in the pool and run the hose to the house and, voila, instant plumbing. Taking care not to disturb anyone’s water supply, I filled my Nalgene and then steri-penned it, missing those days on the South Island of New Zealand where you could scoop a liter of icy water from a stream and drink it down without concern. On the road, I soon passed a very old, slow-moving man who was partially deaf. I startled him as I passed giving the traditional “namaste.” He then smiled and asked “where?” I replied “Timbu” as it was the primary place-name on both maps. He nodded, saying he was going there too. We walked together briefly, but clearly our paces did not align, so bidding him goodbye I went ahead. The roads have many switchbacks sometimes cut short by footpaths. Very soon after parting, I heard a sharp whistle, and the man stood there gesturing toward the footpath just in front of me instead of the road. I smiled, bowed, and thanked him as best I could from the distance. He saved me a kilometer or more, and it was a path well-worth walking, going through a series of recently cultivated terraced fields, including some full grown with winter wheat. Still, most of the day was a long road walk and the dust was inches deep. There were wide flat spots, but when slides occurred, it became steep and narrow, requiring serious concentration. I lost altitude all day, and one point found myself going down a steep switchback just behind some teenagers. There was a youth camp nearby and they were on their way to a ceremony dressed in their absolute best Nepali clothes but still goofing the way a group of teenagers does. As the day wore on, I considered going straight to Timbu which was clearly a decent sized village, but my map did not show lodging there. It did indicate a small trail heading up to Kakani from the road, so at a cluster of houses I asked about the town. According to my GPS I was only about 2 km from Timbu, but it was midday, plenty of time to find Kakani. Some men pointed toward a steep path which I followed for more than a half hour. Walking was difficult because they were preparing the fields and the dirt was soft. Halfway up were a number of women with short heavy hoes working their way through the narrow terraces. They waved, signaling I should continue climbing. Near the top, the path gave out, and I made my way to the edge of a set of freshly planted terraces. With some difficulty I climbed up (they are an unwieldy height) and found myself at the back side of a village. Walking around, the entrance to Kakani (or maybe Gangyul? It is unclear as the maps conflict) was a stupa and a school on a hill. A sign for a hotel and cold drinks greeted me, but walking up the path revealed only rubble. At a nearby house, a young mother said there were no guest houses in town, but she sold me a cold Mountain Dew. I’m fairly certain its been at least 45 years since having one of those. I shared a little with her young son who drank with a frowning seriousness, then set off for Timbu which now was over six km by the road. My choice was to go back the way I came, or hoof it hard down the road. Putting on my seven-league boots, I took off, descending rapidly. Down lower the plants became tropical, including what looked like banana trees. Just outside a house near town, an elderly woman walked out as I passed giving me a very loud and happy “namaste,” and then said “Timbu!” pointing down the slope. It seems the only words I share with the Nepalese are greetings and place names. Another kilometer brought Timbu with only one hotel that had no rooms available. 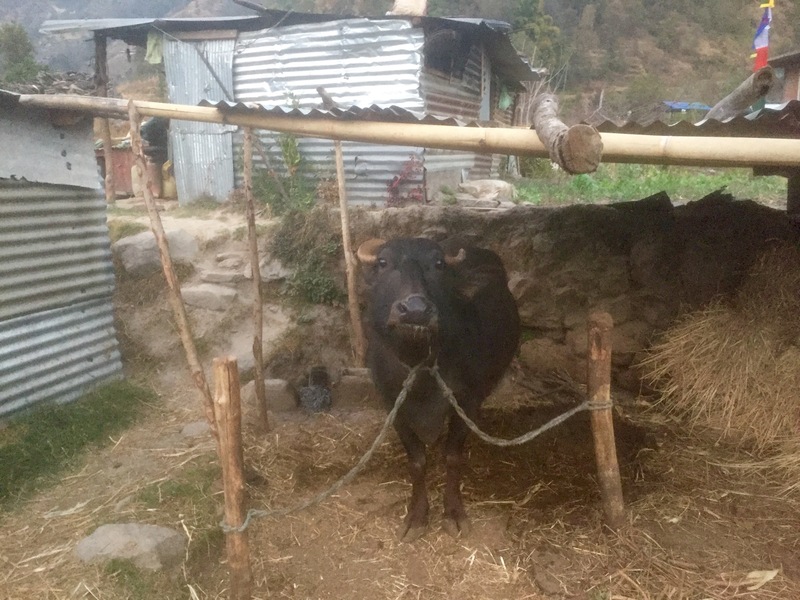 They offered to let me sleep outside on a small patch of grass next to a pen with some large black Nepalese cows (they made a strange grunting sound all night). After pitching my tent, I opted not to hang out with the cattle and instead returned to the hotel for drinks and dinner, starting with a large cold beer which just then was indescribably delicious. I sat in the setting sun watching a crew of men hand-hewing beams for floor joists. They only flattened two sides and didn’t worry if the log was crooked as long as the two flattened sides were in the same plane. It was fascinating work, reminding me of hewing beams with broad axes on the Thoreau House Project some years ago. The hotel had a large kitchen garden and the owners had many children. The older ones were harvesting large roots they called taro while the younger ones whooped, hollered, and fist bumped me while I tried to write. An uncle showed up with a freshly caught fish–looked like a Nepalese catfish–which he cleaned with a large cleaver sharpened on the concrete curb while, on the hill above, an old woman sat cross-legged winnowing grain with a large flat basket. There was too much to see. They offered fish for dinner, but the younger children were so excited about it, I had dal bhat instead (again). The sun set and I made my way to the barnyard, now joined by some stray dogs, and crawled into my tent content.